John Miller, director of the journalism program at Hillsdale College and a national correspondent for the National Review, has longtime roots in Northern Michigan and a long-simmering curiosity about King James Jesse Strang, the 19th-century Mormon renegade who led his followers to establish a colony on Beaver Island. Miller recently acted upon that curiosity by researching and writing a Kindle single (longer than a magazine article, shorter than a book) about Strang’s tumultuous reign that ended badly—some of his followers killed him. 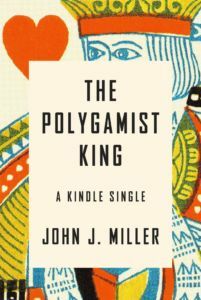 We ask Miller about his lively new Beaver Island history work, The Polygamist King. I suppose anybody who has heard even a small rumor about King James Jesse Strang is curious about him, but you were compelled to move ahead and write 17,000 words about the man. What so captivated you? I just love this story about James Strang. I’ve been interested in it for a long time. I love Northern Michigan and I’m a history buff, and this is a blockbuster history story for Northern Michigan. I just wanted to know more about it. Also I wanted to tell this history in a narrative that is fast paced, that gives the readers what they want, and this format really allows for that. When did the story first catch your attention? I’ve known about the story for some time and have done some casual reading about James Strang over the years. But when I started the project I obviously became much more deliberate about that. I did a lot of reading on Mormonism when school was still in session last year, and then when graduation day came in May, I hit it really hard, doing intensive research from all the major sources. There’s an incredible amount of information online now, including primary documents. Is there anything from the primary documents that really stays in your mind, really says something about Strang? Well, yes. It was in a letter that Strang was writing to his brother. Here, let me get the quote. Okay, yes, the king really puts it out there in that statement. It was a memorable find too because I was working at home and my family was there helping me decipher Strang’s handwriting. There was one word in there, I think it was “wear” that we just could not figure out, and then my son figured it out. It was fun. What about thematically, what held your fascination there? It’s a complicated story about religious tolerance, one that has parallels in our own time. And there are no easy lessons in Strang’s story. This is not a morality play about how to live now. It highlights challenges we are facing and shows how an earlier generation faced similar challenges and didn’t always handle it well. He doesn’t seem like he was probably an easy man to like. No. You could see him as a David Koresh, a lunatic cult leader. But on the other hand, what’s wrong with starting a religious colony and being left alone. And we are fighting this now every day. That is something in itself, a moment when we can look at the past and try to learn from the hard lessons they learned. And of course, good old ancient human passion was involved as well. Is it true he was romancing the wife of one of his murderers? One of the murderers had a wife that might have been courted by Strang. He had five wives at his death—four of whom were pregnant—and some documentation suggests he might have had more and possibly some concubines as well. So you can see where some men on the island might have been threatened by him as the alpha male.